While it feels like Street Fighter II has been released on every platform ever, that's not true, as Capcom never blessed Nintendo's doomed Virtual Boy with the classic fighter. That's where fans come the rescue, as Hyper Fighting has introduced Street Fighter II to wildly outdated 3D. Only a few copies are out there, sadly, because actively selling Hyper Fighting could raise the attention of Capcom and bring the nifty fan project to a halt. Plenty of companies are fine to let fans mess around with their games, but the moment money becomes involved, it's different. The game footage looks a little cleaner in this video, thankfully. In a nutshell, it looks pretty good! 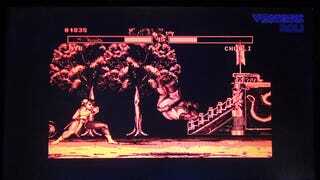 I mean, as good as Street Fighter II can look on a Virtual Boy. It's more impressive as a clever feat of engineering than something you'd want to spend much time playing, but as with Quake running on an oscilloscope, fans can pull of basically anything.